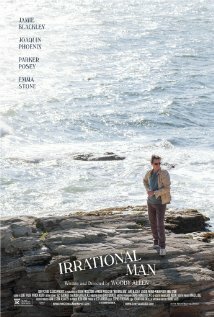 Sony Pictures Classics releases Irrational Man at Angelika Film Center and Lincoln Plaza Cinemas on July 17th, 2015. NYC MOVIE GURU: How do you attract such a talented A-list cast? Woody Allen: There’s an enormous amount of talented actors and actresses around and not a lot of projects. There’s a lot of major talent out there, they don’t get enough work, meaty work. They get a couple weeks here or something else in a blockbuster picture, but you know, they’re out there. Those blockbsters are very tempting pictures for enormous amounts of money and enormous recognition, and you know, we offer them scale and nothing---almost no-frills kind of situation, but they will take it if they don’t have an offer from a blockbuster movie, and they will take it because they like to act. If you give them something to act that isn’t just running and ducking, explosions, chasing cars, if you give them a part to act, they’ll do it. They have heart, and they want to work, and they, you know, they’re actors, they’re artists. So if you give them something decent to sink their teeth into, they accept it and they’re willing to sacrifice the money. WA: It was actually Juliet Taylor, my casting director, who said that she had just run into Parker and chatted with her somewhere in Europe, and that Parker seemed to her a very good possibility for this role. As soon as Parker came into our cutting room, the second we saw her, I thought she would be absolutely perfect for it. It turned out that she was better than perfect, she made a contribution to the role far in excess of what I wrote. Very often you’ll write a character and you write it, and it’s okay, and then you luck out and you get an actor or actress who brings something to it and it’s suddenly — and you get the credit for it as the writer and director — but the truth is, the actor has brought some kind of flare or personality to it, way above and beyond the relatively bland character that you wrote. NYC MOVIE GURU: What appeals to you about making a murder mystery? WA: You know, it interests me in serious things, really serious things like “Crime and Punishment” or “Macbeth,” but it also interests me when I see an Alfred Hitchcock and it’s well done, you know, on any level. It’s just something that I like. I like to read it, I like to see it, and it’s fun to make it. If you get an idea that has some substance to it, you know, I thought when I did Match Point it had some substance, that it would not just be an airplane read, a whodunit, you know, that it had the chance to say something. So it was worth me trying it. I felt that in this picture too, because for some reason, it’s the stuff of drama. Murder is used all the time, from the Greeks through Shakespeare. It’s just the stuff of drama. NYC MOVIE GURU: What do you think makes Abe such an interesting character? WA: At the beginning of the movie, he’s completely spent. He’s shot. I mean, all his idealism, everything in his life, he doesn’t care if he lives or dies. Nothing has gone right for him in his life. All these thoughts, noble thoughts, nothing seems to work, people have let him down in his estimation and the world has not operated well for him. And then finally, there’s a religious aspect. He gains faith in something. Of course, what he believes in is totally irrational, but it’s no more irrational than Catholicism or Judaism or any of the religions, in his case, it’s really crazy. And he believes in it, and it turns his life around, but unfortunately, it’s not the kind of choice that you want to make, that you want other people to make. NYC MOVIE GURU: Parker, how do you view the relationship between your character and Abe? Parker Posey: Joaquin’s character is like the minotaur in the maze and the women who are shining a light in his darkness, who are compelled and attracted and are flirting with the irrational man for whatever reason. For me, Rita just is teetering on her fantasy that he represents, and she is conscious and unconscious of it, as we see her, you know? She has experienced many loves and is in a marriage that is not very potent. So, she has this fantasy, and the timing is everything. We see the timing come to her in this kind of mystical way, and then it’s taken away from her. I love this movie, so I’m looking at it from the outside now since I’ve seen it once. It’s a very female story, the awareness and the consciousness, the women who survive these irrational men in this society right now. NYC MOVIE GURU: How do you feel about being among the great and influental filmmakers of our time? WA: I really don’t know a lot about that, that some guy in Oklahoma is watching my film in a class and getting something out of it. I don’t really know about a lot of that, and it always amazes me when I do hear about it. I don’t see any evidence of an influence by me. I don’t say this in any disappointment, I really don’t care, but I just don’t see it, objectively. I see Marty Scorsese influencing everybody, and deservedly so, he’s fabulous … I’m not looking for that, I want to just make my films and put them out there and be left alone. But I don’t see it, I don’t see my influence anywhere, I don’t see learned articles written about me, or any fuss made, and that’s fine. As long as people back my films and I can make them. You learn early on, when you go into the business, you think the fame and fortune is going to be euphoric. Then you find that it’s empty very quickly, and you find that what’s really fun, the only payoff is the act of making the film, showing up in the morning with Jamie and Parker and Emma and Joaquin, and getting out there with the cameraman and getting the costumes right… The reaction to it by crowds, the reaction by critics, the money it makes or doesn’t make, it doesn’t give you any joy. You don’t get anything out of that. You thought you would at first, but what you really get the joy [from] is sitting down in a room with Juliet Taylor and saying, “Who can we get for this part?” and speculating a name, or what recording, should it be Ramsey Lewis or Mozart behind this? That’s the fun of making the movie, so that’s what I concentrate on. I don’t see myself as a factor in motion picture history. I see myself as getting the Cy Young award. You won 511 games, a quantity award. I’ve made many films. Big deal. I’ve had good health, and I’ve had longevity.